I’m proud of my city today. As I pour over the posts, pictures, and videos showing the many ways in which its citizens have come together over the past few days, I’m proud. I’m impressed that we have followed the humble leadership of the victims’ families, choosing prayer over protest and grace over retribution. 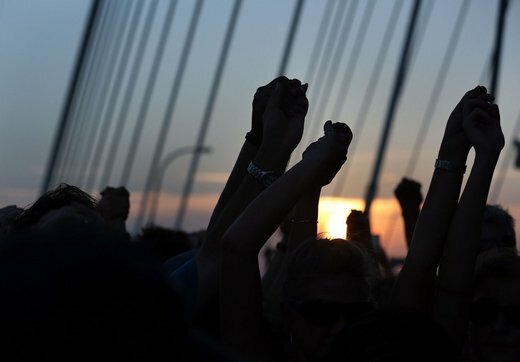 The thousands who joined hands across the bridge last night made quite a statement to our city and to our world. I didn’t make it to that event. To be honest, I was exhausted. The emotional impact of the week was intense, and I didn’t have the energy to shed even one more tear. And, to be brutally honest, I was suspicious of the whole thing. I was afraid that it would be a gathering of white people attempting to make ourselves feel better about being White. I was afraid that the only message it would communicate to our Black brothers and sisters was that we know how to exploit media opportunities and to restore Charleston’s reputation as a gracious host. I see now I was wrong. I see now that it was indeed a beautiful show of solidarity and a pure expression of love and hope. I was relieved when I saw pictures from the bridge of how many people showed up, of which people showed up – white and black, young child and senior adult – hand in hand, spanning more than two miles of bridge and extending further than a camera lens could capture. I’m grateful I was wrong. And now I can’t help but wonder, where do we go from here? What happens next? Petitions to remove the Confederate flag from statehouse grounds are circulating, and leaders are speaking out. It’s a good start, but will it be enough? T-shirts and bumper stickers are being printed. Charleston has its own power-filled hashtags – #CharlestonStrong, #UnityCharleston, #PrayforCharleston, etc. It’s a good start, but will it be enough? Will it be enough to spark new conversations around dinner tables? Will it be enough to build new bridges? Will it be enough to fundamentally change the attitudes and perceptions around race in this state? In this country? Since I woke up to the news Thursday morning I’ve wanted to say something, to do something. I’ve read statements from across the country – some of which have made my stomach turn due to the ignorance with which they were made, others of which read like a punch in the gut due to the truth to which they pointed. To pretend that Wednesday night’s massacre was anything less than an act of racial terrorism is to perpetuate the violence. Dylann Roof’s motive was clear, his actions calculated; and both were based on his belief in the supremacy of one race over another. To ignore the facts or to make attempts at softening them in any way is tantamount to harboring terrorists. We must change. If we really want to honor the nine victims of Wednesday night’s attack, we must take action beyond symbols. I’m all for symbols, don’t get me wrong, but symbols have no power beyond that to which they point. To what truth will all those joined hands direct us? To what end will the hashtags and t-shirts and bumper stickers be shared? I’m glad we’ve honored her, but I’m not worried about Emanuel AME Church. Christianity is about resurrection, and Emanuel has risen before. She will rise again. Perhaps she already has. I’m not worried about the families of the nine victims. They have already shown us all the power of a faith that can move mountains. They will continue to grieve their loss. They will face unspeakably difficult days ahead. And when they do, they will turn to their God and to one another to help pick up the pieces and move forward. But, what about the rest of us? Will we continue to heed their humble leadership? Will we turn to God and to one another? What will we do to move forward? Perhaps it isn’t the only answer, but it sure seems like a good place to start. May it at the very least be so.